Images Show Mars Rover Photos Shot on Earth? No, Here’s Proof. This pair of images freaks some people out. Are photos from Mars really from Devon Island and other Earth locations? Are these really the same hill? Is it just a coincidence? Look closely. Decide before you read on. The answer to this mystery is below. Uncomfortable ramifications of something being true can cause extreme changes in perception. In other words, people will hallucinate to protect preconceptions. Are you hallucinating this hill similarity? If you are a straight laced person who would never accept that NASA would mislead anyone, it would be understandable if your mind logically decides these are absolutely NOT the same hill. The problem is, it is. It’s the same hill. How can that be? Ah ha! This proves a huge NASA conspiracy, right? Uh, no. Slow down and think about the possibilities. 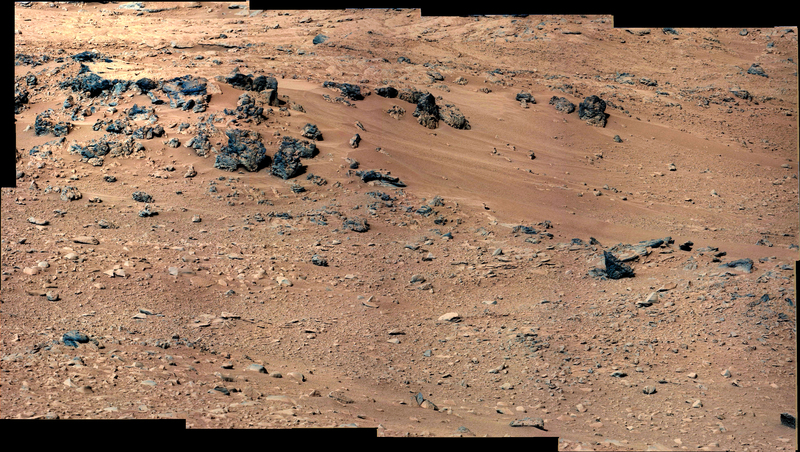 ANSWER: The two hills can be the same because you won’t find this photo “of Mars” in the NASA rover images. It isn’t there and no one ever said it was taken on Mars. This “Mars” photo was created by Danny Wilten to demonstrate that earth locations could be made to look like Mars. He turned the existing stock earth photo (left) of Ireland into Mars with Photoshop (right) to illustrate his view that we did not go to Mars. Except if you were to blow up his image, would the vegetation really be gone? I don’t think so, and that’s not the point he is making. Wilton is saying that with plenty of time and money, NASA could use photo tools to fake the rover images and Mars landscapes. I’m not so sure. They’d need a lot of land since there are many years of rover images. The Internet being what it is now, Wilten’s fake Mars photo is being used by many sites and videos as proof that NASA is pulling one over on us. Some clowns even make a big deal of the fact that this image is not Mars, ignoring that NASA never said it was. Facepalm. I’d like to kindly remind my fellow Mars interested web sites not to mislead people with these images by letting them think the image on the right is really a NASA image of Mars. It isn’t. It never was. These sites either know that and are being deceptive to get attention or they are lazy and did not do the fact checking that should happen before posting a story. No, this is not Mars, and this is not true. Pintrest, you make us stupid. Adding a NASA logo does not make this a NASA photo. It is a visual lie. So far, not a single photo of many taken over many years by several NASA rovers posted on their web site has been shown to be a photo taken on Earth. It would be really big news if it was. Have at it. Exactly. It takes thought and usually some work to find the truth on a case by case basis. What’s the saying? “Don’t let the truth get in the way of a good story”? Thanks for your detective work and exposing these paranoid “theorists.” Too many people buy into these false narratives and I’m glad you’re using facts to fight the fiction! Thanks for following me. Now doing the same. Great post. I suppose we have to fairly accept that most of what we’re told is going to be true. Would be interesting to learn about any really big whoppers though. which is mentioned on a video embedded in the article link at disclose.tv, And no, its not a huge section of the photo, you do have to zoom in to see it. Fortunately for NASA and the rest of the US government, most people are lazy – and therefore willfully ignorant – and will believe the fake news being fed to them from not only NASA but from all the major media outlets. And the powers that be can count on many of their brainwashed viewers to defend them, which these viewers do, as a way of dealing with the cognitive dissonance produced by information that they can’t handle. Hello. Thank you for this comment. I agree that we should fairly examine the evidence on a case by case basis. Unfortunately, there is only so much time in a day, and more junk than careful research so it is useful when people make a clear and concise case for something unusual. I’ve previously looked at a picture of what looks like an arctic lemming on Mars. That was a visual coincidence a bit too strong to just ignore. I’m glad to take a look at strange possibilities. The fun of exploration is why some of us are here! Keep drinking the koolaide. And believe in the cosmological constant while youre at it. You know, the one that causes science to declare there are infinite universes in order to justify the odds SCIENCE calculated of our universe existing. Wow, talk about FAITH in make believe! I tend to think we are all always learning new things and that we make best guesses bases on available evidence (which can unfortunately be as non-scientific as “someone said it, so I believe it” types of evidence). There is definitely an inertia in human nature that slows us from flipping to new views without propper convincing. Where do you weigh in on the universe being a simulation?